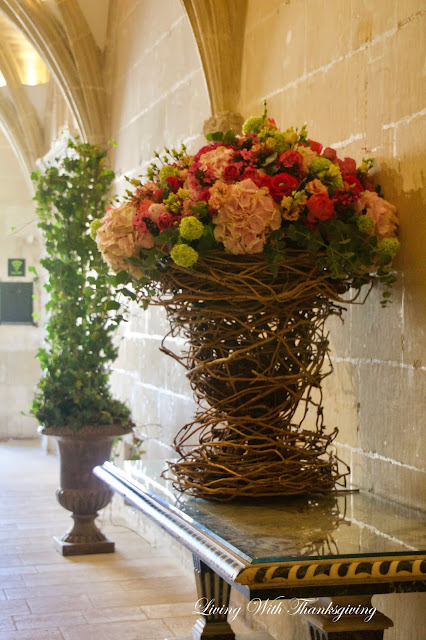 Travel with me to France to Chateau Chenonceau in the Loire Valley of France and see beautiful fresh flower arrangements in every room. 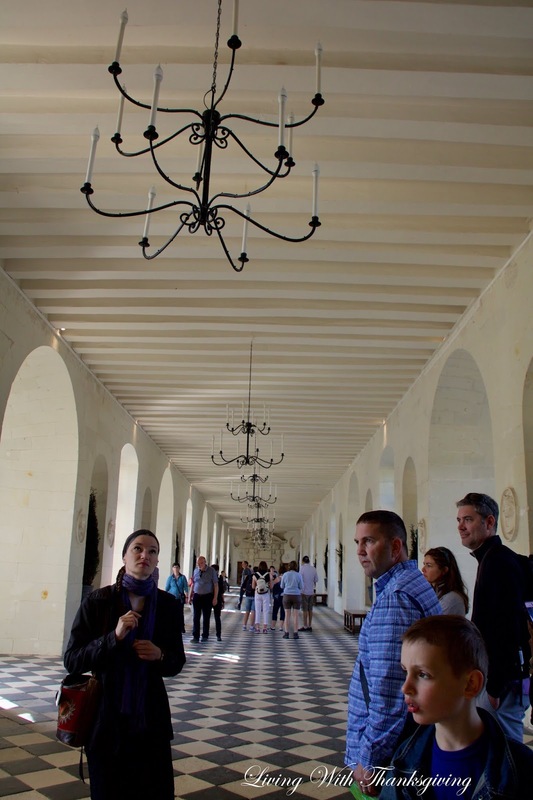 The elaborate architecture, period furniture pieces, and fine art work along with the lovely flower arrangements make Chateau Chenonceau a favorite among visitors. 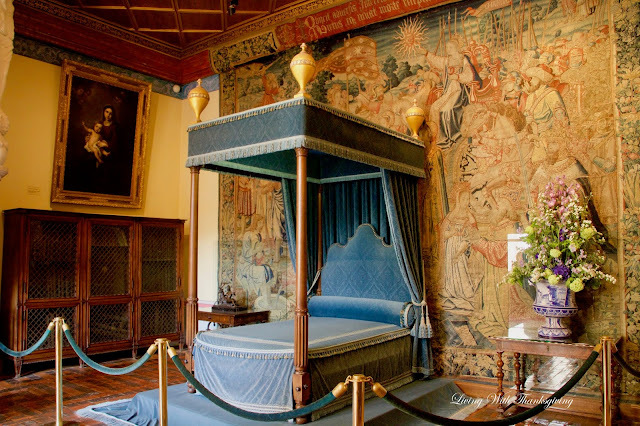 This is Diane de Poitiers' bedroom, King Henri ll's favorite lady to whom he donated Chenonceau. 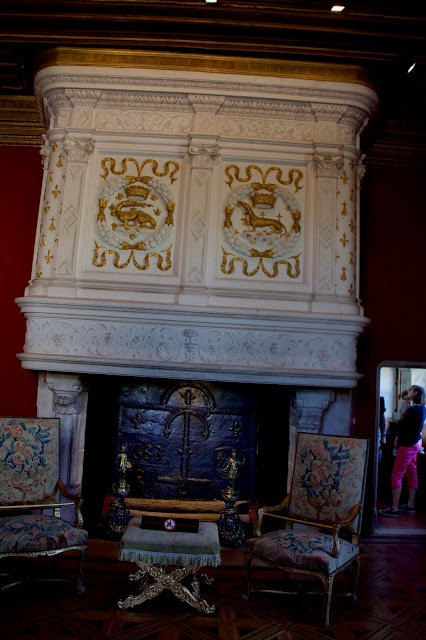 In 1559, after King Henri's death, his widow, Queen Catherine de Medici, had the chateau given back to her by Diane in exchange for Chauont-sur Loire. This arrangement in this exquisite vase was my favorite of all the flower arrangements. The first thing Queen Catherine de Medici did was to place a portrait of herself in Diane's room. This room had a river view and had great natural light. The Gallery Measuring 60 meters in length, 6 meters in width and with daylight from 18 windows, a tufa and slate-tile floor and exposed joist ceiling, this is a magnificent ballroom. Notice the embossed medallions of historical people along the wall. Also, the live topiaries prominent in the niches. During the winter, they still light wood fires for warmth and historical ambience. 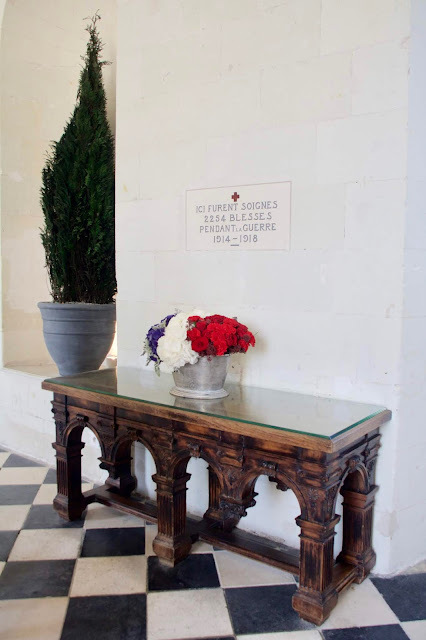 This arrangement in the Gallery, even though it reflects the later period of the french revolution, was my inspiration photo for a patriotic post you can view here. All the flowers in the chateau arrangements are grown in a vegetable and flower garden on the property. I did not get to see the cutting garden or the greenhouses but read about them in the guide book. 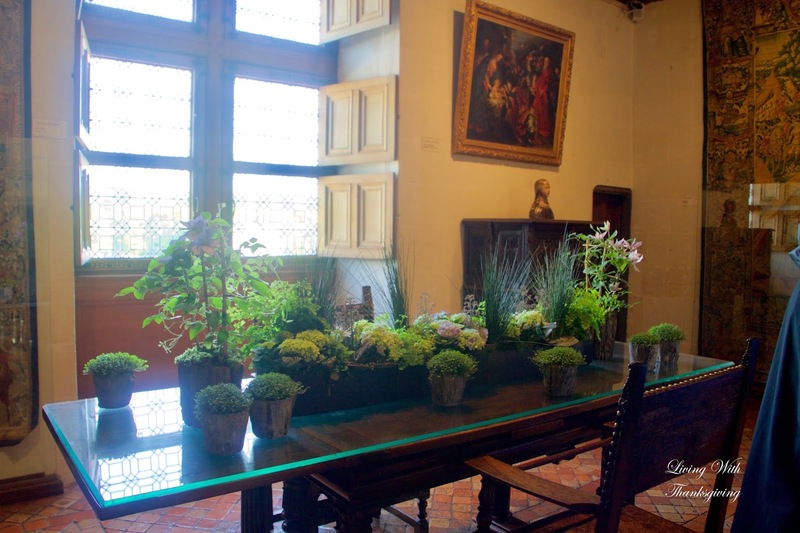 A team of 10 gardeners work this garden, tend the greenhouses and keep the fresh arrangements throughout the chateau. 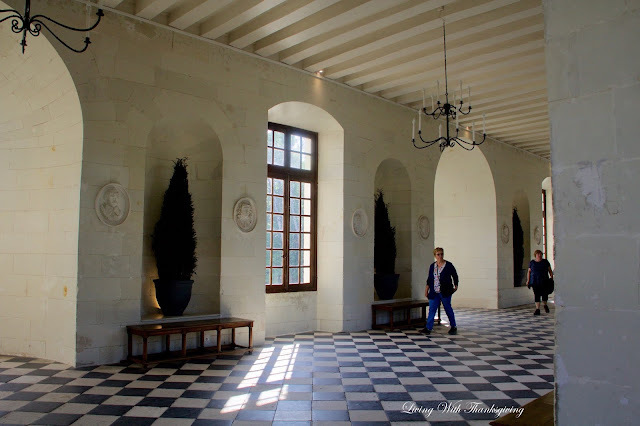 You might be interested in following Chateau Chenonceau's instagram here. 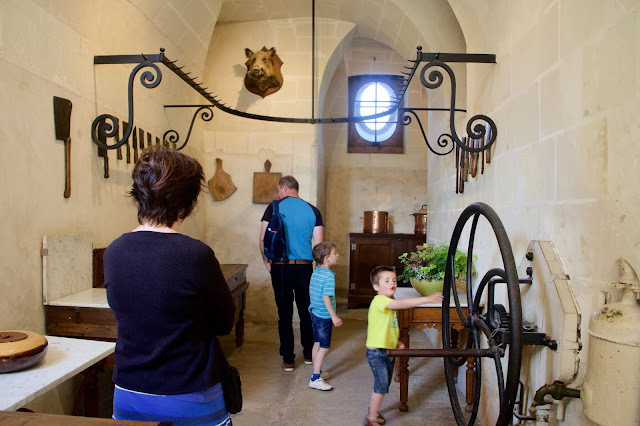 You can see the cutting gardens and flower designers at work and many other gorgeous photos of the Chateau and gala events there. I was thrilled to see many other flower arrangements in some of the same places I had photographed. It is beautiful decorated for Christmas! This hall is covered with a series of rib vaults and I wish I had gotten a good picture of the beautiful ceiling in this hall. 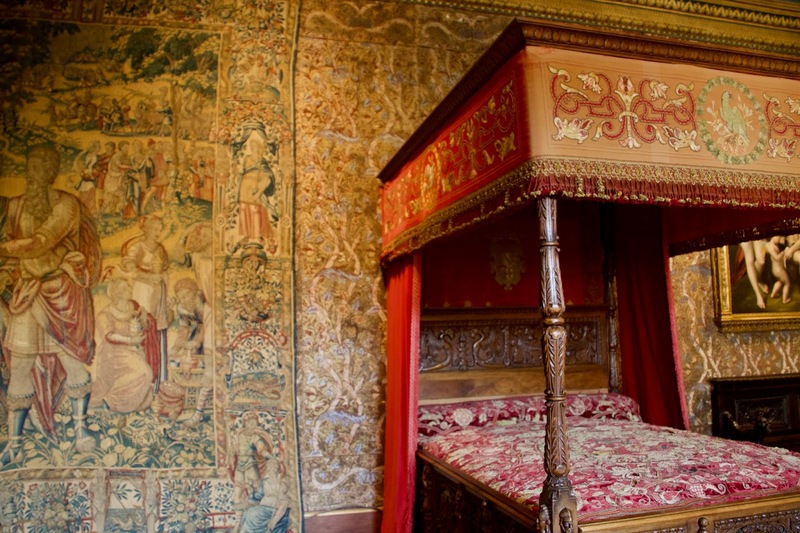 The gorgeous textiles on the beds were stunning as were all the tapestries. Note the flower arrangements on the bedside tables. This is a close up of the matching tables and identical arrangements on each side of the bed. 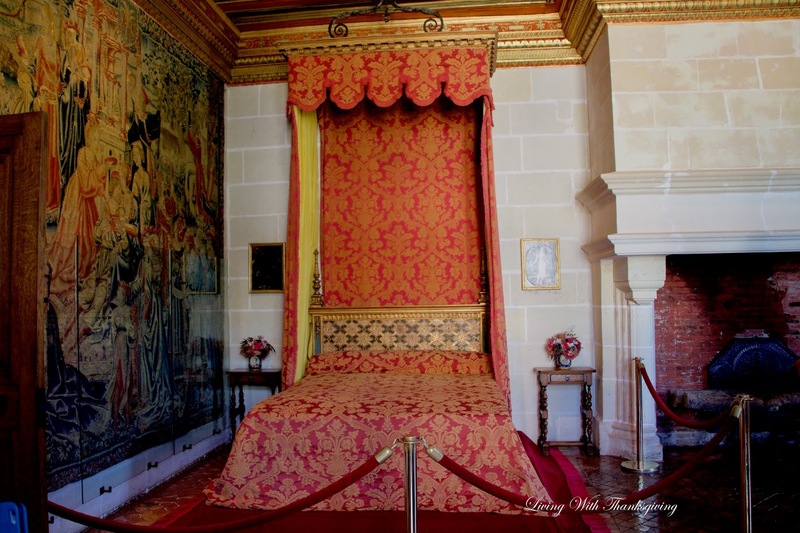 This is Queen Catherine de Medici's bedroom. I wish I had a picture of the entire room but it was crowded and hard to get a good picture without people in the way. As shown here, can really see the beauty of the tapestry with good light. Close up of the flower arrangement. I think you can see how thrilling it was for me to see all these creative arrangements. 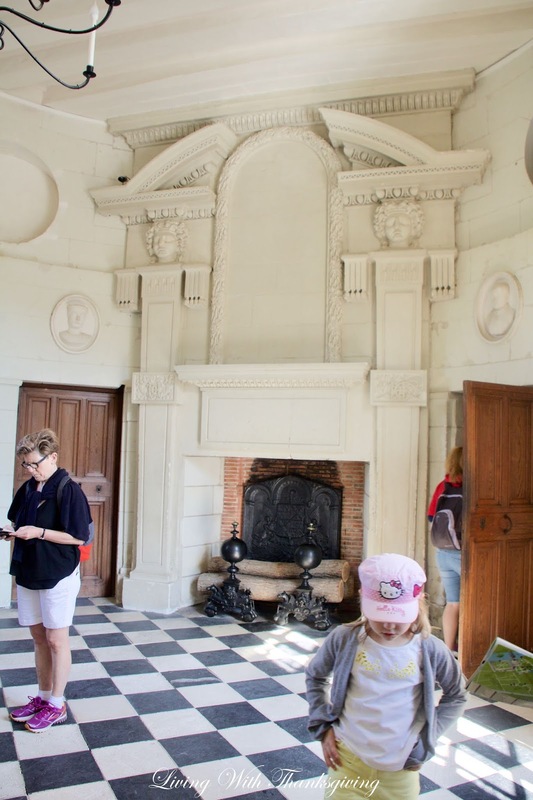 All the fireplaces were very elaborate. This is Louis XIV's drawing room. 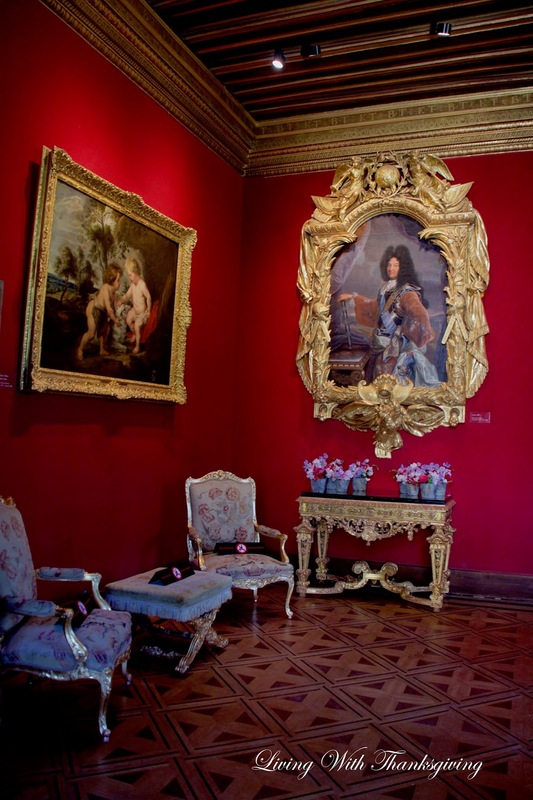 King Louis XIV Drawing Room. 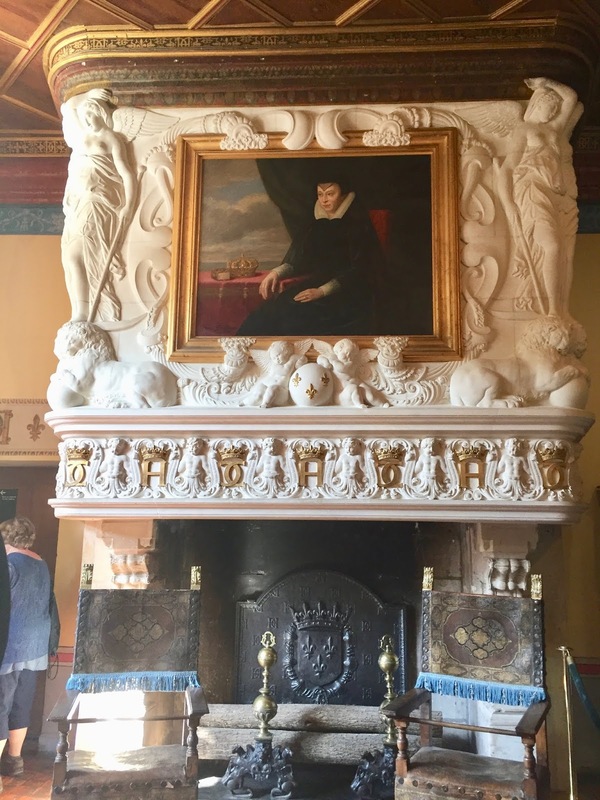 He visited the chateau once and in memory of his visit years later gave his uncle the Duke of Vendome his portrait in this extraordinary frame. 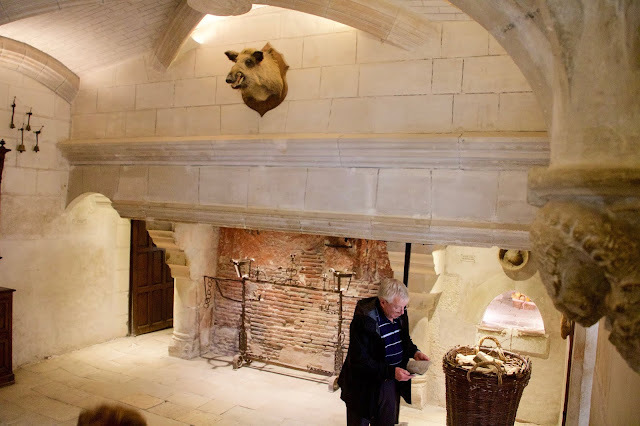 We enjoyed hearing the history of this chateau and the history of the furnishings and its inhabitants over the years. I covered some of the history in the post, Gardens in France. 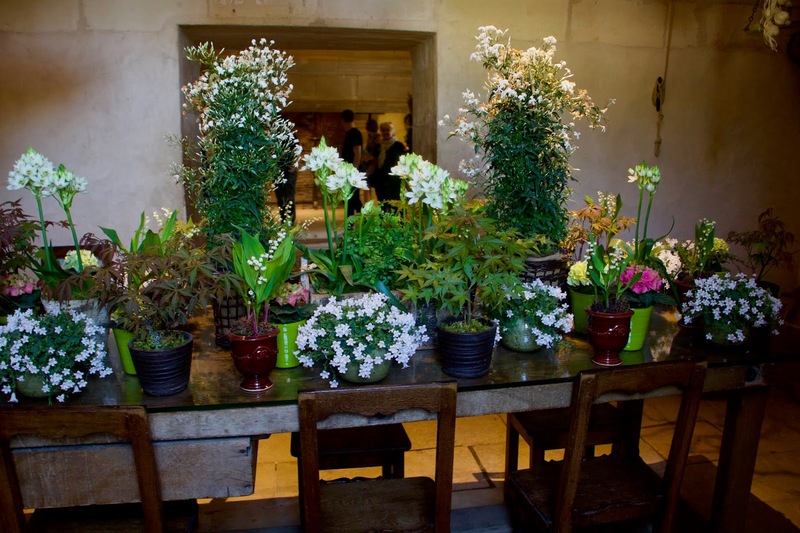 Today, I am concentrating on showing some of the interior rooms and the flower arrangements I was able to photograph. There is just not time to cover all the history. However, I did find it interesting that, during World War II, the Chateau was used by the Resistance as a bridge out of occupied France across the River Cher into Vichy. 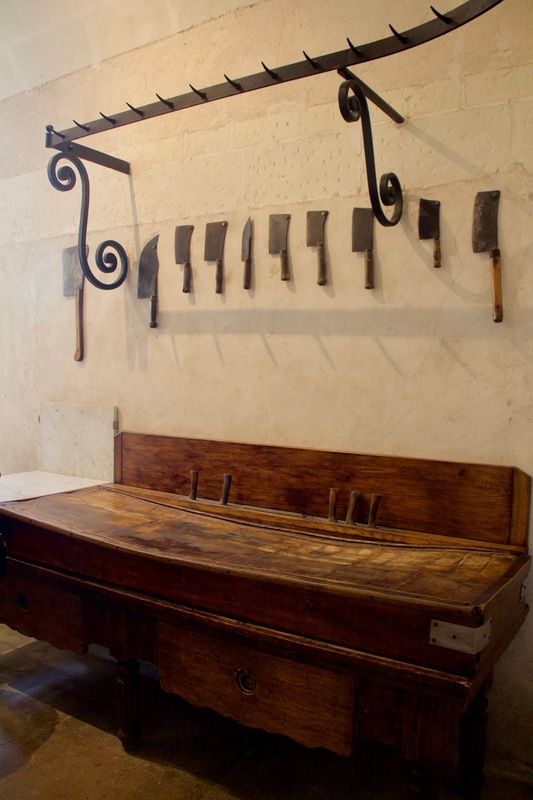 During the First World War, it served the French more conventionally as a hospital. Now, onto the kitchens with multiple rooms. This elaborate display was beautiful and very fragrant. The copper pots were impressive and look at that ceiling and the stone walls and floors. I would love to talk to the gardeners/floral designers that work at Chateau Chenonceau! They are very talented people. If you are planning a trip to the Loire Valley and you are flower lover like myself, plan an entire day for your tour. We saw two other chateaus the same day we toured Chenonceau and I would have liked more time there. I was in awe of the beauty I witnessed there. I'm blown away by everything in this post, Bonnie. Those tapestries in the bedroom were to die for, as were the all the textiles and I'd love to work in that kitchen, though the stone floors might be a little bad on the back over time! Of course, the arrangements are dazzling. Truly spectacular. You should be sharing this one with Paris in July at Thyme for Tea, too. Posts aren't just about Paris! This is all so beautiful, Bonnie. Ahh, sweet revenge by Catherine after Henri II's death. 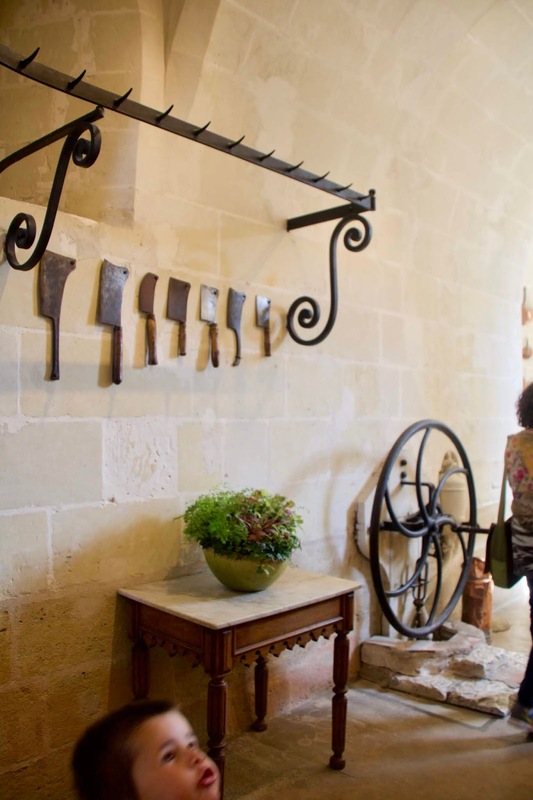 That kitchen, where the work is performed - love the ceilings, walls, tools and butcher table, not to mention the herbs. 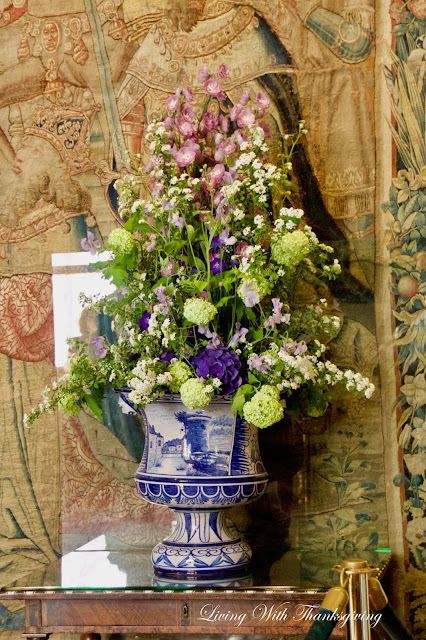 I think my favorite floral arrangement is the one in Catherine's bedroom. Did you notice the bleeding hearts? How apropos. Bonnie, this post is beautiful as well as highly informative. The arrangements are so lovely and I don't have words for all the magnificent beauty you so skillfully captured. This trip will be whirling in your mind forever, and I am sure only made you want to visit again soon. Thank you for creating this wonderful post for all of us to enjoy. Happy summer days, Bonnie. 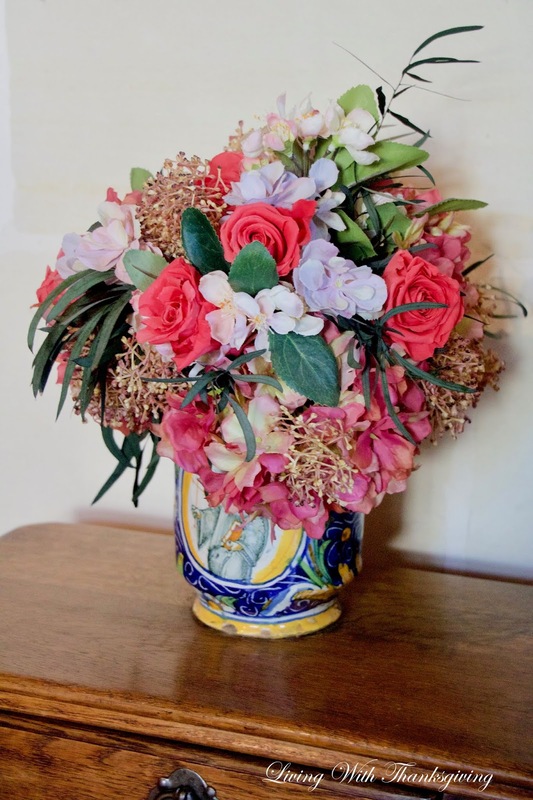 Bonnie, these creative arrangements are so beautiful. The tapestry, the ceilings and walls so outstanding. As usual, you do an amazing job sharing the history. Extraordinary! 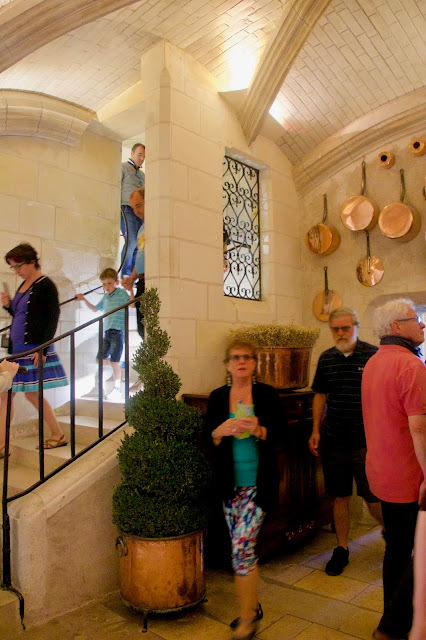 Bonnie, what a gorgeous post my friend, I must travel to the Loire Valley. The floral arrangement are stunning. Can you imagine having gardens that could supply such amazing flowers? I have to agree with Rita, my favorite is the one in Catherine’s bedroom. I loved seeing the tapestries, they always are amazing. 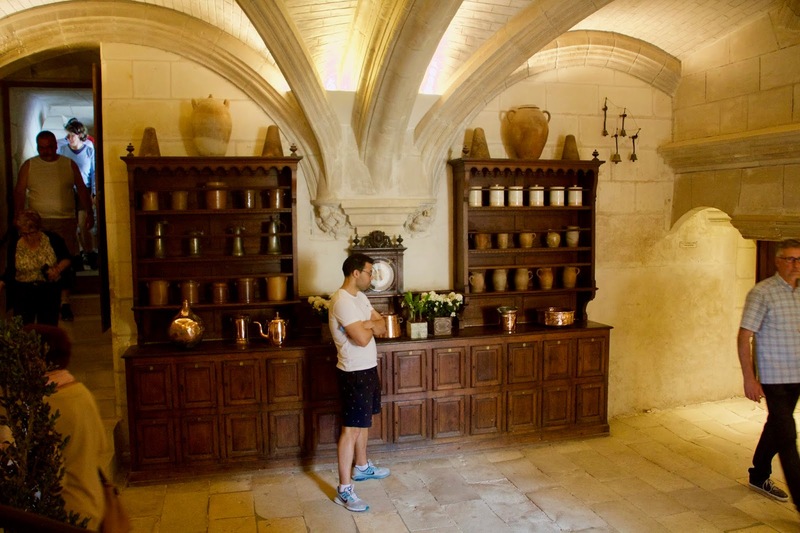 The kitchen was so interesting, love the herbs, and did I see Mike? 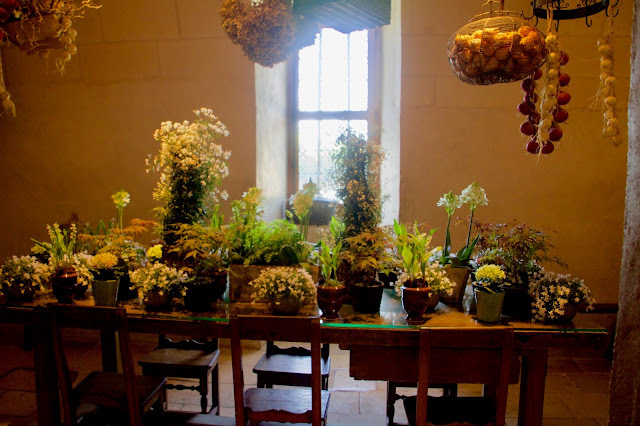 Thank you for sharing this lovely post at Gardens Galore! WOW!Thanks for this stunning tour!Hugs! You are lucky that you were there in the days of digital photos so you could capture all those wonderful interiors! When we were there, those old film cameras were just not capable of such great photos, and you were never allowed to flash! Just beautiful Bonnie...I'm delighted to be an armchair traveler with you. 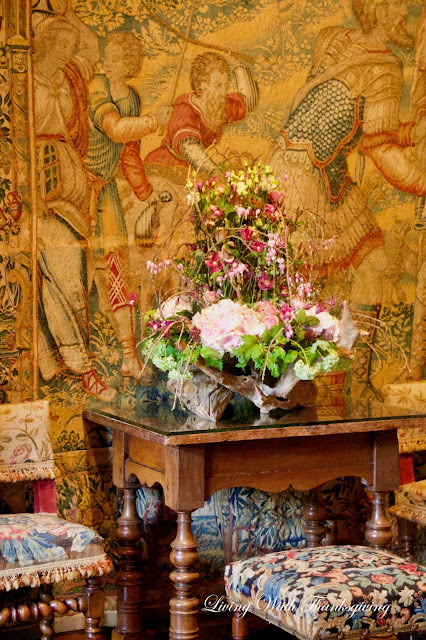 I love seeing the arrangements as well as the stunning tapestries and beautiful architecture. I had to brush up on my French history and do a google search on Catherine de' Medici. Can you imagine being a bride at the age of fourteen and wed to the King of France?! I’m amazed at it all. I can’t imagine actually being there. I was admiring the floral arrangements too- my favorite was the one in the big woven grapevine vase. 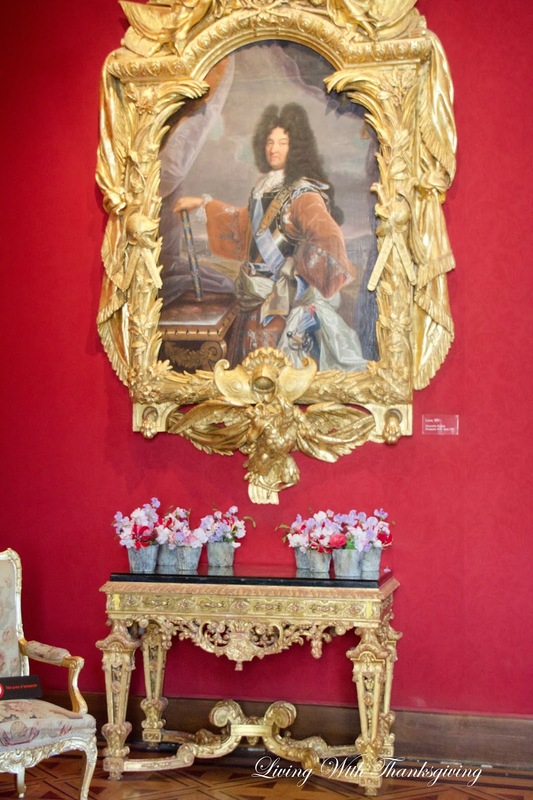 That frame around the portrait of King Louis XIV is extremely elaborate. Love seeing the kitchen area. Is that a grinder for wheat to make flour? They surely lived different lives back then! Beautiful tour, thank you for sharing it. Love the floral arrangement in the rooms. I love to enjoy tours like this. What a wonderful tour, Bonnie, and I feel that I was right along with you, through your photos. My favorite flower arrangement was the one that had the grapevine encased vase. 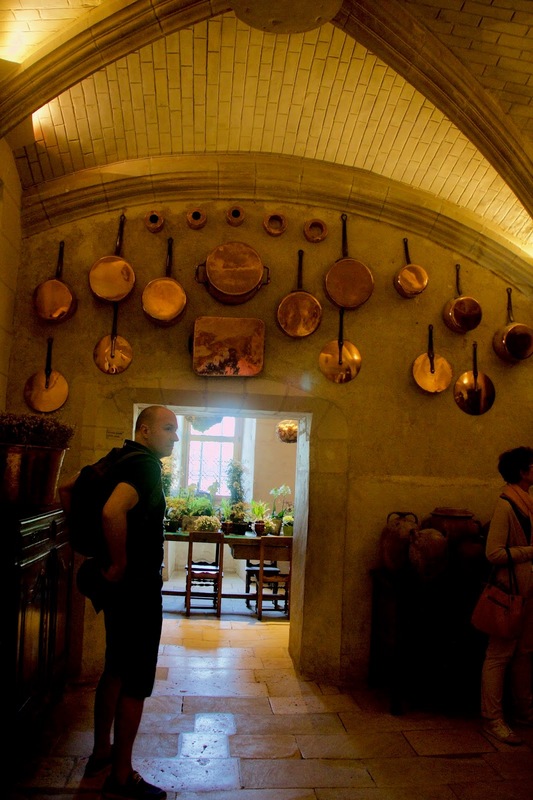 Of course, I loved seeing the kitchen and all those shiny copper pots that were hanging. Thanks for sharing the beauty with us. Bonnie, I have so enjoyed your post this morning! 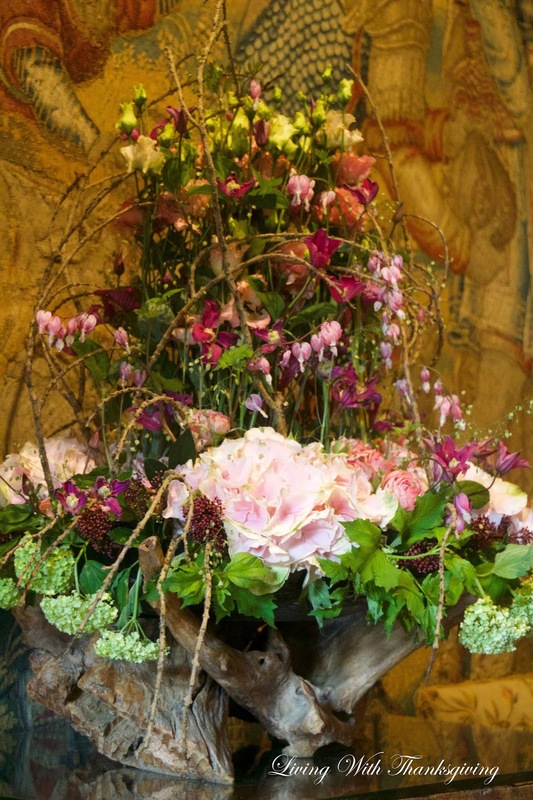 Wow, I can’t even imagine growing so many beautiful flowers to create those stunning arrangements! 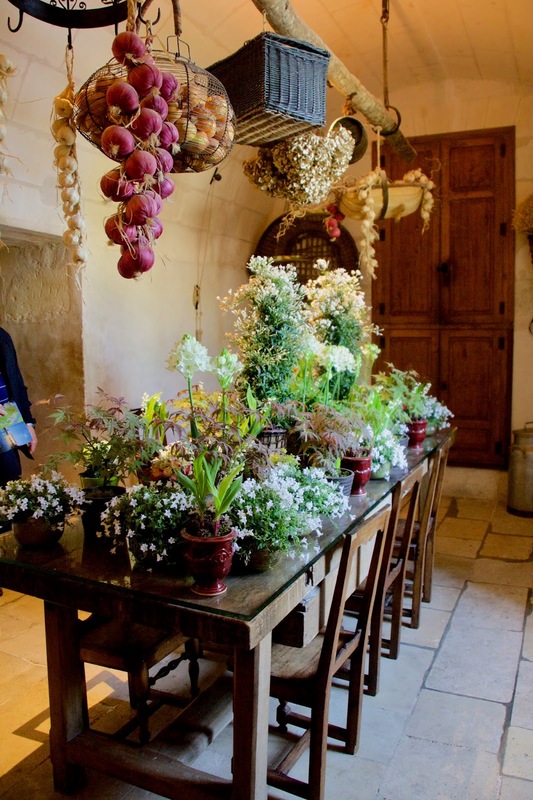 It would be very interesting to visit with the gardeners and florists. Thanks for the Instagram info. I followed the chateau this morning. Enjoy your day, sweet friend!!! This was a treat to see! The flower arrangements were spectacular! Glad to know about the Instagram info as well! That arrangement you said was your favorite was likely my favorite, but when I saw those tables in the kitchen, oh, WOW!! How amazing! 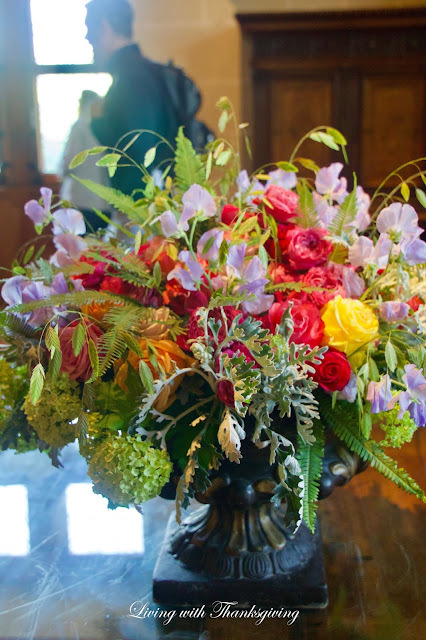 What stunning arrangements...and to think that all the flowers are grown on the property! Just beautiful! Thanks for taking us on the tour and thanks for linking up to the Take Me Away Party again this month!